On July 13, Capt. 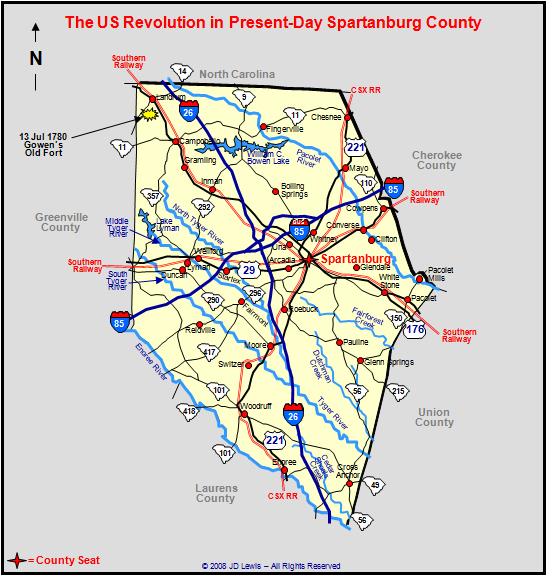 John Jones was leading a force of 35 Patriot militiamen (Burke County Regiment - NC). They were going to join Col. Charles McDowell in North Carolina. On the way, the Patriot militia surrounded and attacked a Loyalist camp of American Volunteers at Gowen's Old Fort. The Loyalists were pursuing Col. John Thomas's 1st Spartan Regiment of Militia. The Loyalists were forced to surrender without any serious resistance. Near the headwaters of the Saluda River, Capt. John Jones's guide, a frontiersman named Benjamin Lawrence, told them that there was a band of Loyalists nearby who were going to pursue those who had attacked them. They were the American Volunteers who had fled to Gowen's Fort after they had been ambushed at Cedar Springs. Capt. Jones told his guide to take them to the Loyalists. His plan was to trick them into thinking they would join up and pursue the Patriots. Lawrence had Jones wait in the woods as he scouted the old fort. He told Jones that the fort was garrisoned by the Loyalists, but no British Regulars. After nightfall, Capt. Jones and his men approached the men in the fort. Jones and his men were welcomed inside and given food and drink. Following dinner, Jones gave the signal, and his men immediately seized the fort. One Loyalist was killed and three others wounded. Thirty-two (32) immediately surrendered and called for quarter. Four fled towards the Pacolet River. Capt. Jones ordered the prisoners' weapons to be destroyed, except those that would be useful to his men. He then paroled the prisoners and took as many horses as they could move with.